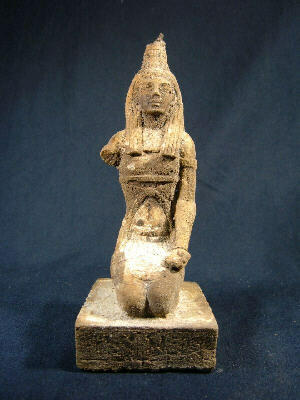 On auction is a very rare ancient Egyptian "Kneeling Priestess", from the New Kingdom Period(1539-1075 B.C.). 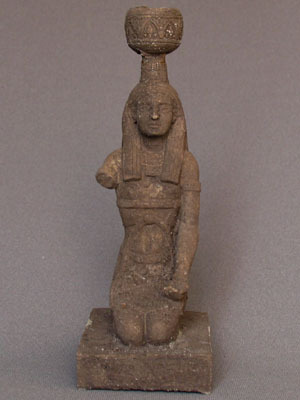 We acquired this item last month from a private collection in Egypt. It has been in this collection for over 50 years and its true provenance is unknown. This beautiful piece is carved from stone and has only a few minor flaws. It is broken at the middle portion and she is missing her arms. She is depicted in a humble kneeling position making an offering to the gods. She has a long wig tied in the back with a "Tyet Knot" ribbon, likely symbolic for the "Knot of Isis". On her head is a crown also similar to many Isis statues and reliefs. She is bare breasted, has necklacing and a kilt-like dress with a sash that is tied in a "Tyet Knot" style. The enitre base is surrounded with faintly visible hieroglyphics. This item has significant age wear but is truly a work of art! This is a one of a kind antiquity and we may never be able to aquire another one of this particular type and style! Don't lose the opportunity to add this beautiful relic to your ancient Egyptian collection! The above listed item is from the New Kingdom,(1539-1075 B.C.E.). This rare item is made from stone composite and depicts a kneeling priestess in a humble position making an offering to the gods. She has a long wig tied in the back with a "Tyet Knot" ribbon, likely symbolic for the "Knot of Isis". 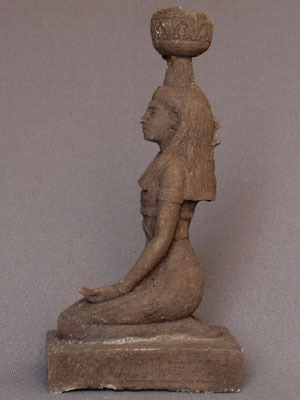 On her head is a crown also similar to many Isis statues and reliefs. She is bare breasted, has necklacing and a kilt-like dress with a sash that is tied in a "Tyet Knot" style. The enitre base is surrounded with visible hieroglyphics. She has one arm missing and the piece has areas encrustation and age wear. These type of priestess statues are very hard to acquire. The reason for the item being available is due to the vast extent of archeological findings, thousands of years in Egyptian burials and also the proliferation of these said items in older private collections worldwide.